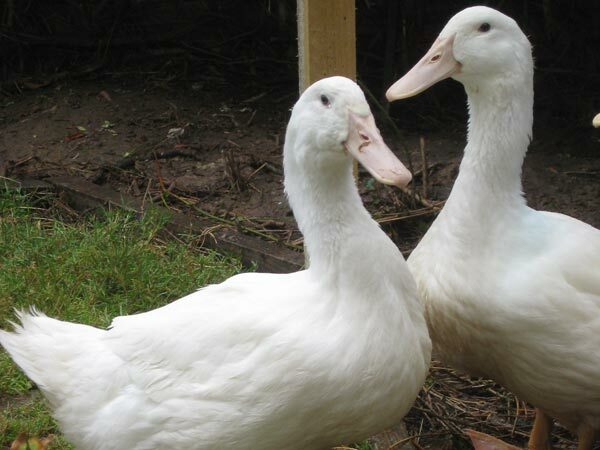 Duck hatching eggs are available from the end of February through to end of May/early June, goose eggs are only available during March to May. Contact us with any enquiries or to place an order. For prices see our For Sale page. Hatching eggs can be sent anywhere in the UK but please note that we cannot send eggs outside of the UK. Fresh hatching eggs can be collected from the farm or mailed in multiples of six (multiples of four for goose eggs), sent first class using polystyrene egg posting boxes. We do test our eggs regularly for fertility, so regret that we are unable to make refunds or replace eggs that do not hatch. All our birds have tested negative for salmonella. Please note that as the summer draws on duck eggs in particular naturally become less fertile; from a 95-100% fertility rate in early Spring, by end of June we achieve a fertility rate of 66% (although we cannot guarantee that you will). Please be aware of this when deciding to purchase eggs, and that fertility diminishes further as summer progresses; we stop selling duck hatching eggs in June. Our Aylesbury ducks are reared for both meat and eggs; after years of duck keeping, a duck egg is now far preferred to those of the hen for their taste, not just through sheer greediness for their superior size. 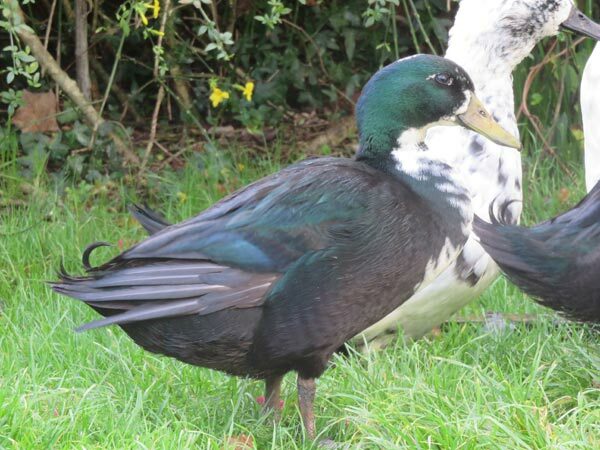 Our Aylesbury hatching eggs are available from February through into July, and are from a flock of very active and large, unrelated drakes and ducks. The Aylesbury is a fabulous meat breed, with a dressed weight of 6-8lbs, and they aren’t slack in the egg department either, producing an egg a day throughout the laying season; the eggs are very large and creamy white. These are the Jemima Puddleducks of the waterfowl world. Please note that we only sell hatching eggs, not birds. We keep a small breeding flock of Shetland ducks, the rarest duck breed in the UK. Our birds were hatched from eggs sourced from the Island of Trondra, in the Shetland Islands, where the birds were saved from extinction by Tommy and Mary Isbister. We have been surprised and delighted that the ducks lay almost year round – they must find our Devon weather a doddle in comparison to their Shetland origins. 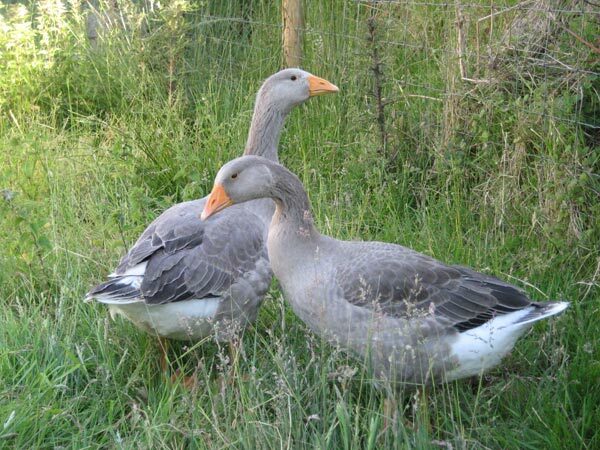 Although laying is prolific, the breeding season is still limited to spring and early summer. Please note that we only sell hatching eggs, not birds. We have kept various chickens (and guinea fowl) for many years but hadn’t had any clucking around for far too long. 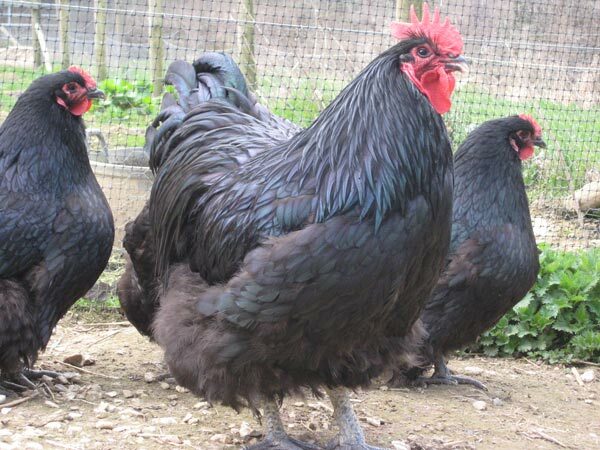 In 2010 we decided to remedy this and have developed a small flock of rare breed Black Orpington large fowl. We don’t sell Orpington birds or hatching eggs. 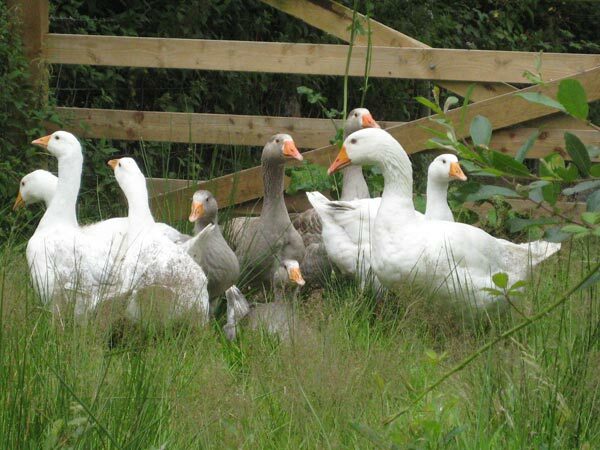 Pilgrim geese are a light weight auto-sexing breed, their colour indicating their gender (the gander is white with some grey speckling, the females a light grey with some white). Pilgrims are now officially on the Rare Breed Survival Trust at risk register. Our pilgrims are beautiful calm birds and we have hatching eggs for sale between March and May. Please note that we only sell hatching eggs, not birds. 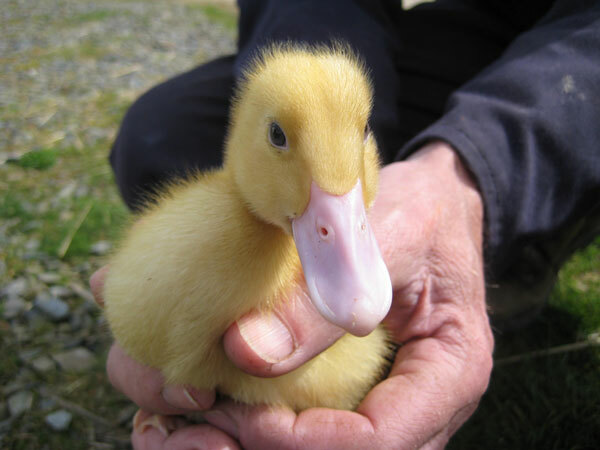 In response to lots of queries about the hatching and raising of Pilgrim geese and ducklings, we have produced a Pilgrim Gosling factsheet and a separate duckling factsheet. On receiving hatching eggs: When you get your eggs, store them overnight in a cool room, pointed side down, and then bring them up to room temperature before putting them under your broody or into the incubator. “Last year I bought some Aylesbury hatching eggs from you and they were a big success. The resulting birds were a very good size (finished at 8-9lb), much the best of all the ducks I produced last year. I would like to buy some more this year.” CD, Orkney. “My wife bought some duck eggs from you a couple of months ago. The Aylesburys are huge, I think they double in size each week. We will be back to you in the spring for some more.” IG. “Thanks again for raising such excellent (Black Indian Runner) ducklings. They arrived safe and sound and are installed in the kitchen”. JK, Scotland. Please contact us to place an order or if you have any questions. For prices, see here. Not only are our pigs captured in print, but both our Aylesbury and Black Indian Runner ducks have acquired a bit of fame of their own; they now feature in Jack Byard’s Know Your Ducks, published in Spring 2011.